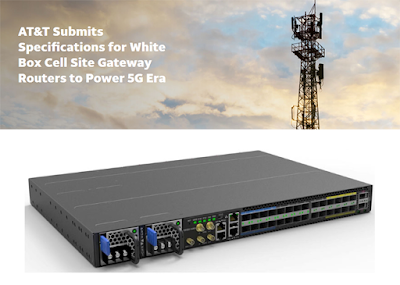 AT&T published specifications for a "white box" cell site gateway router designed to serve its backhaul transport requirements in its next-gen network. AT&T has previously disclosed plans to deploy up to 60,000 such routers at cell towers over the next few years. The specs, which are being released to the Open Compute Project, could be used by network vendors as reference designs. AT&T is developing its own network operating system software, based on technology from its Vyatta acquisition, to control and manage the white box hardware. It decouples hardware from software, so providers have freedom to choose software implementations that best support their business and operational models. It is designed to support a wide range of speeds on the client side including 100M/1G needed for legacy Baseband Unit systems and next generation 5G Baseband Unit systems operating at 10G/25G and backhaul speeds up to 100G. It is designed to operate at industrial temperature ranges (-40C to +65C). It features the Broadcom Qumran-AX switching chip with deep buffers to support advanced features and QOS. It includes a baseboard management controller (BMC) for platform health status monitoring and recovery. It includes a powerful CPU for network operating software. 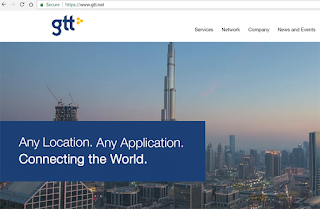 It has timing circuitry that supports a variety of inputs and outputs to meet the evolving timing requirements and implementations in the 5G technology evolution. The Linux Foundation will host a new Disaggregated Network Operating System (DANOS) project to enable community collaboration across network hardware, forwarding and operating system layers. DANOS is initially based on AT&T’s “dNOS” software framework of an open, cost-effective and flexible alternative to traditional networking operating systems. A first code release is expected the second half of 2018. 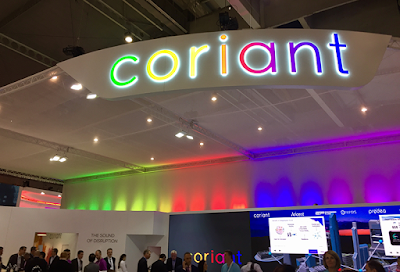 Infinera completed its previously-announced acquisition of Coriant. 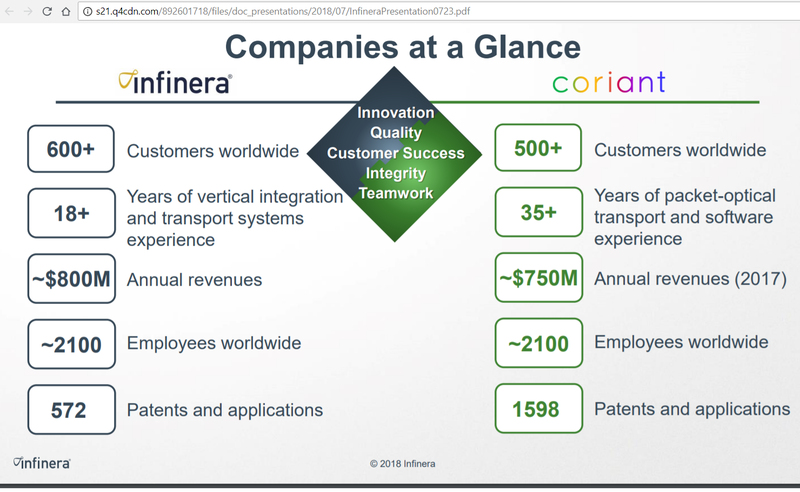 Under the deal, which was announced on July 23, 2018, Infinera issued 20,975,384 shares of its common stock and will pay an aggregate amount of cash consideration consisting of approximately $230 million, of which approximately $154 million was paid upon closing. Infinera said the acquisition significantly increases its revenue and customer base. 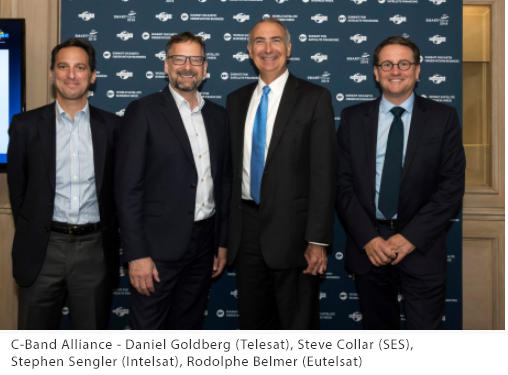 The newly combined company serves nine of the top 10 global network operators and the top six global internet content providers as customers. The combined portfolio includes end-to-end packet optical network solutions for communications service providers and internet content providers. FCC Chairman Ajit Pai outlined his strategy for pushing the U.S. into a leadership position with a "5G FAST Plan". There are three key components: (1) pushing more spectrum into the marketplace; (2) updating infrastructure policy; and (3) modernizing outdated regulations. These are summarized by the FCC as follows. Speeding Up State and Local Review of Small Cells: The FCC has reformed rules designed decades ago to accommodate small cells. Cisco completed its acquisition of Duo Security, a privately-held company headquartered in Ann Arbor, Michigan, for $2.35 billion in cash and assumed equity awards. Duo Security specializes in unified access security and multi-factor authentication delivered through the cloud. Duo Security's solution verifies the identity of users and the health of their devices before granting them access to applications. Cisco said the acquisition enables it to extend intent-based networking into multicloud environments. Cisco currently provides on-premises network access control via its Identity Services Engine (ISE) product. Duo's software as a service-based (SaaS) model will be integrated with Cisco ISE to extend ISE to provide cloud-delivered application access control. Duo's technology will also add trusted identity awareness into Cisco's Secure Internet Gateway, Cloud Access Security Broker, Enterprise Mobility Management, and several other cloud-delivered products. BT Group officially transferred 31,000 employees to Openreach, the final step in establishing Openreach as a legally separate business. "This is an on ongoing process, and success requires continued commitment to the right behaviours, as well as transparency on how the arrangements are working in practice. We are committed to working with the regulator and industry to ensure customers up and down the country get the connectivity and customer service they deserve," stated BT Group Chief Executive Gavin Patterson. In addition, as of today, BT’s ‘Northern Ireland Networks’ division will be rebranded ‘Openreach Northern Ireland’. Openreach announced plans to accelerate its rollout of Fibre to the Premises (FTTP) across the UK. The new "Fibre First Programme" represents a strategic shift in the way that Openreach thinks about last mile infrastructure. Going forward, the company will seek to deploy "fibre first" wherever possible, including in rural areas. Openreach said its new goal is to reach three million homes and businesses by the end of 2020. The programme will start in a few months in an initial eight cities – Birmingham, Bristol, Cardiff, Edinburgh, Leeds, Liverpool, London, and Manchester. Reaching an all-fibre network across the UK is a massive and Openreach said the full rollout may take decades. Intel reported 95 new performance world records for its Xeon Scalable processors as achieved in servers from major original equipment manufacturers, ranging from single-socket systems up to eight-socket systems. The new performance benchmarks were achieved in a variety of server platforms, ranging from general computing workloads running on single-socket systems to advanced technical computing and big data analytics workloads running on eight-socket systems. All systems tested include mitigations for Spectre and Meltdown. stated Lisa Spelman, vice president and general manager of Intel Xeon products and data center marketing. Last week, Intel CFO and Interim CEO, Bob Swan, disclosed that its data-centric businesses grew 25 percent through June, and cloud revenue grew a whopping 43 percent in the first six months of the year. Responding to increasing demand for server and PC processors, Intel updated its CAPEX guidance for the year, saying it now plans to invest a record $15 billion in capital expenditures in 2018, up approximately $1 billion from the beginning of the year. Intel is investing $1 billion into its 14nm manufacturing sites in Oregon, Arizona, Ireland and Israel. Swan also cited progress with 10nm, stating that volume production will begin in 2019. Network Security Appliance market revenue grew nine percent year-over-year in 2Q 2018, according to a new report from Dell'Oro Group. "The Firewall –Enterprise segment again realized robust growth in 2Q 2018, increasing 15 percent year-over-year to record levels," said Casey Quillin, Director at Dell'Oro Group. "Networks now require protection against numerous vulnerabilities, from securing connectivity for multiple users and device types to mitigating the risks of delivering disparate applications in hybrid Cloud environments. New products addressing, especially those with application-aware or next generation functionality, are driving high-end firewall revenue growth," Quillin continued. The top Firewall –Enterprise vendors in ranking order are Cisco, Palo Alto Networks, Fortinet, Check Point, Huawei, and Juniper. 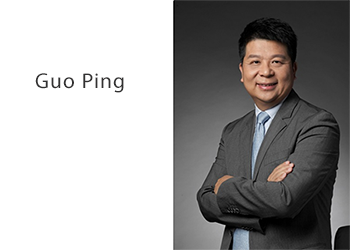 Mr. Guo Ping has taken over the position of Rotating and Acting Chairman of Huawei. He will serve from October 1, 2018 to March 31, 2019 as the company's top leader, and head the Board of Directors and its Executive Committee. Guo has worked at Huawei since 1988 and has served as R&D Project Manager, General Manager of Supply Chain, Director of Huawei Executive Office, Chief Legal Officer, President of the Business Process & IT Mgmt Dept, President of the Corporate Development Dept, Chairman and President of Huawei Device, Rotating CEO of Huawei, and Chairman of the FC. IEEE and the IEEE Standards Association (IEEE-SA) are launching an the Ethics Certification Program for Autonomous and Intelligent Systems (ECPAIS). The idea is to offer a process and define a series of marks by which organizations can seek certified A/IS products, systems and services.